This is one classy package - steeped in heritage, a choice of vibrato or trapeze versions, not to mention aggressive on-the-street pricing, this is a compelling offering. Loads of fun to play. Great value. Gary Clark Jr's meteoric rise to fame since the release of his major label debut, Blak & Bu, in 2012 hasn't come from YouTube hits. Nope, the Texan native has done things the hard way and earned his stripes from extensive gigging, building a unique demographic that straddles blues guitar fans and modern R&B lovers. While he also plies his trade with Gibsons and Fenders, it's the Epiphone Casino that Gary Clark Jr is most associated with, along with a burgeoning pedalboard and his Fender Vibro King and Princeton Reverb. Never afraid to step outside of 12-bar blues constraints, and with his latest album, The Story Of Sonny Boy Slim, just released, Clark is establishing himself as a the coolest young guitar hero around. 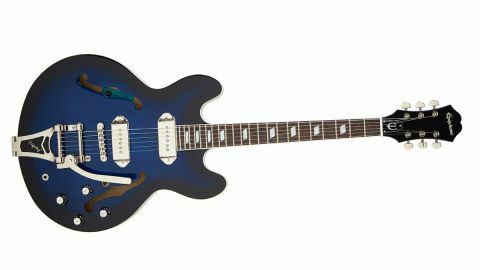 Epiphone clearly knows when its on to a winner, as the company has wasted no time producing a signature model, the Gary Clark Jr 'Blak & Blu' Casino, which is available in both our featured Bigsby version or with a trapeze tailpiece, which retails at £619. In its Blueburst hue - a dark blue 'bursted top with black sides, back and neck - it's far from traditional, but that suits our man to a tee. Unlike the other Chinese-made Casinos currently offered by Epiphone, this one comes without a pickguard and with Gibson USA P-90s housed under their metal covers. And, colour aside, there are no signatures to put you off if you don't like the artist. This is simply a very cool, unusual guitar. The Casino doesn't have a Gibson ES-335-style centre block, and is instead fully hollow, like an ES-330. That immediately gives the instrument a lightweight feel, and while the Bigsby adds weight, it also adds balance strapped on; the trapeze version is slightly neck-heavy by comparison. Speaking of necks, Epiphone has spec'd this one with a '1960s SlimTaper D Profile', which in the hand feels a little bigger than the relatively trim front-to-back depth. The wide and low frets are nicely installed on the rosewood 'board and sit over the white edge binding for maximum playing width. Setup, as supplied by Epiphone, is almost too low, and it would easily suit a higher action and heavier strings - on the standard 629mm (24.75-inch) scale, either 0.010s or 0.011s would certainly work. Clark is hardly a shredder and, of course, thanks to that lack of centre block, the neck joins the body at the 16th fret, which actually makes upper-fret work a bit of a stretch. From the guitar's acoustic resonance, you get an idea of what's in store: it's a lively performer, with a very different, shorter and pluckier response, compared with a centre-blocked semi or, certainly, a solidbody. It's also worth noting that the Bigsby version sounds more airy than its trapeze'd sibling. Controlled in classic Gibson fashion with a three-way toggle pickup selector and volume and tone for each single coil, there's a host of sounds to be found here, though, it takes a little time to dial in. That bridge pickup can be a little spiky and the neck almost a little too mellow played clean, but pull down the bridge pickup's tone control and you get forceful bite while the neck sounds effortlessly jazzy and bluesy. Add some dirt, however, and you get into Clark's signature tonal area: the Blak & Blu produces a really rootsy, fuzzy and swampy electric blues voice that spins back a few decades. At higher gains and volume, the pickups make the guitar very lively; there's a bit of microphonic squeal, too, but control that and sustaining feedback is effortless. And with Casino users including The Beatles, Stones, The Jam and even The Beach Boys, to name but a few, you certainly won't be short of tonal inspiration.